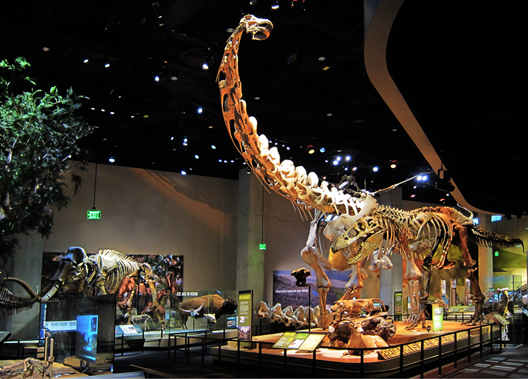 The Perot Museum of Nature and Science opened in a new facility in the Victory Park neighborhood of Dallas. The building houses 11 new exhibits in a cube-shaped structure with dramatic views of downtown Dallas. As part of the Amaze Design team to develop five new permanent exhibit halls for the Museum, Carol was the lead exhibit designer for the T. Boone Pickens Life Then and Now Hall and the Rose Hall of Birds. The Life: Then and Now Hall houses the museum's extensive paleontological collection, featuring current and emerging research. The Rose Hall of Birds features the museum's important library of bird-related books and manuscripts, taxidermy and fossil collection, and a full-body flight simulator that lets one take to the air as a bird avatar. Life: Then and Now features awe-inspiring fossil finds like the infamous predator Tyrannosaurus rex or the plant-eating Alamosaurus.